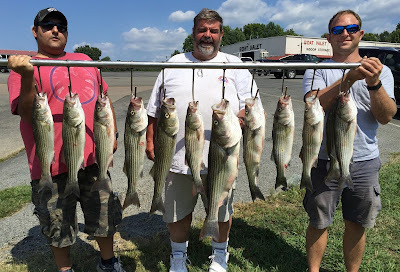 Lake Anna Striper Guide Journal: Thousands of Stripers not wanting to eat. I filled the tanks up with 230 baits this morning, picked my clients up at 6 at High Point and took off in search of Stripers. I checked a couple of areas but boat traffic kept running through where I wanted to fish so I made a move back downlake. I found a school off of a mainlake point so I stopped and we set up on them. Just after stopping fish started breaking nearby us and we started hooking up. I saw hundreds of fish but the bite was not in line with the amount of fish I was seeing. It was quite cool this morning and I believe the front had contributed to the lack of hook ups. After loosing this school I looked around and found remnants of them and worked them for a few minutes. Fish were everywhere but pretty well scattered, not schooled tightly. A friend Dale was trolling across the lake from me where I had found thousands of Stripers two days ago and I noticed he turned around in that area so I called him on the radio and asked if he saw any fish over there. He had run over them and had turned around to hit them again. He had 3 hook ups and hung the other rig up. He called Tony and myself over to fish it with bait because there was too much irregular structure for him to work. We went over and the mother-load of Stripers were there. We set up on them but again for seeing thousands of fish on the depth finder we were only catching a few here and there, and mostly punks. After 45 minutes of working them and catching maybe 20 fish it got way too crowded with boats so I moved on. We hit a couple of other areas catching fish everywhere we went. Reed was hot this morning catching well over half of the fish while Carmine sat patiently up front. 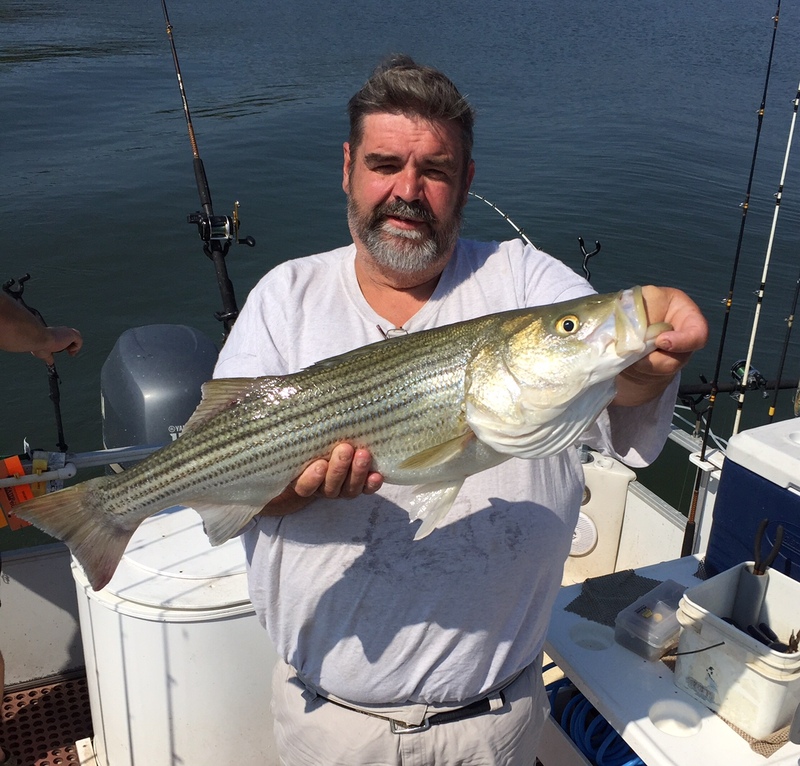 He got the last laugh by catching the biggest Striper of the day. Although we found thousands of fish today the Stripers really did not cooperate and we only caught about 35. The guys had a great time with that but I know what it could have been if the fish wanted to eat this morning.